This craftsman style home takes advantage of hillside views with its deck, patio, and abundance of rear windows. An open floor plan enhances the home's spaciousness. The great room features a cathedral ceiling, a fireplace with built-in cabinets and shelves, and access to the generous rear deck. 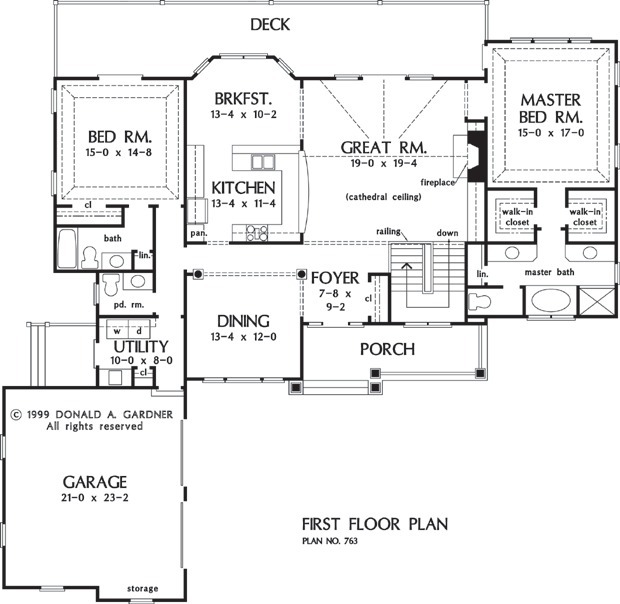 Designed for ultimate efficiency, the kitchen serves the great room, dining room, and breakfast area with equal ease. A tray ceiling lends elegance to the master bedroom, which features deck access, his and her walk-in closets, and an extravagant bath with dual vanities, large linen closet, and separate tub and shower. A second master bedroom is located on the opposite side of the house and enjoys its own private bath, tray ceiling, and deck access. 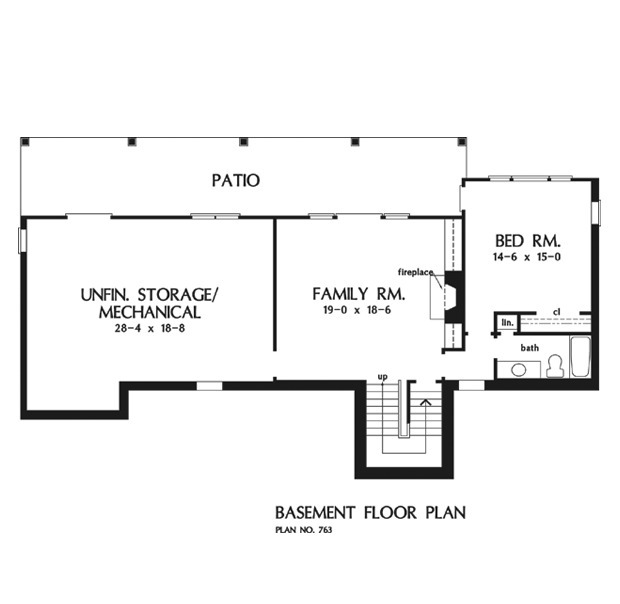 Downstairs, a spacious family room with fireplace, a third bedroom, and full bath complete the plan. Other Storage: 621 Sq. Ft.
House Dimensions: 72' 4" x 66' 0"
Great Room: 19' 0" x 19' 4"
Bedroom #2 (Tray): 15' 0" x 14' 8" x 10' 5"
Bedroom #3 : 14' 6" x 15' 0" x 9' 5"
Breakfast Room : 13' 4" x 10' 2" x 9' 0"
Deck / Patio : 60' 0" x 8' 10" x 0' 0"
Foyer : 7' 8" x 9' 2" x 9' 0"
Garage : 21' 0" x 23' 2" x 0' 0"
Great Room (Cathedral): 19' 0" x 19' 4" x 18' 2"
Kitchen : 13' 4" x 11' 4" x 9' 0"
Other : 19' 0" x 18' 6" x 9' 5"
Porch - Front : 21' 8" x 6' 6" x 0' 0"
Storage (Other) : 28' 4" x 18' 8" x 0' 0"
Utility Room : 10' 0" x 8' 0" x 9' 0"